Thank you! This wainscoting was achieved with poplar detailing over drywall that was then painted with a lacquer finish. This is a great trick for getting the look for less! 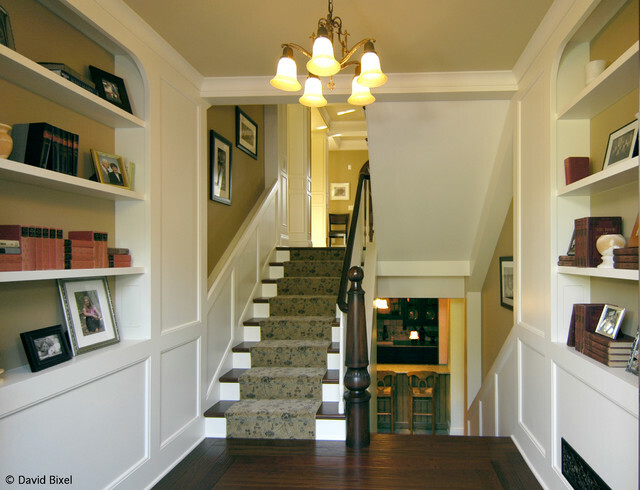 What's the spacing of your wainscoting? Hi, where did you get stair post? Thanks! Could you tell me the dimension of the newel post? Thanks! I too love the carpeting. May I also ask for the name of the manufacturer of the carpeting? Beautiful carpet on stairs! Can you share maker and pattern/color? what is the depth of your shelves? Can you please tell me the paint color on the wall and wainscotting? Again. couple things I always talk about. One the lower third of wall, not plain and boring. Don't have a simple wall when you could use and give it character. It doesn't matter that it is little depth.